I’m not a great homeschooler. Really. When I imagined homeschooling I pictured my family sitting on blankets in a field on a prairie reading Anne of Green Gables and eating homemade bread and jam while we absorbed the beauty of the knowledge in the stack of books we had brought with us. Okay, so I am a bit of a romantic. Also, possibly delusional. Whatever. The truth is in this particular stage of life homeschooling looks a lot more like us scrambling to find sharpened pencils and desperately trying to get as much school done as we can while a very very very busy toddler takes a nap. It’s not generally pretty. But we get it done. Mostly thanks to a few things that work for us. They aren’t necessarily revolutionary but they work for us. Online free curriculum – We use a lot of online tools in our homeschool. Kahn Academy is a fantastic resource for math of all grade levels and we love using it. Starfall has been a staple for the little kids for as long as we’ve been homeschooling and it helps to entertain them and make them feel a part of school when they are too little to do much on their own. Homeschool curriculum is not cheap and any freebies we can find help take the financial burden off of the process. Sites like Easy Peasy All-in-One Homeschool are also an excellent source of 100% free homeschool curriculum. This particular site breaks everything down in days using free links to web content that allows the student to be self-directed. We love it as a supplement to the other things we do but many families use it for their entire school curriculum. Single focus days – We’ve done this during different seasons of homeschooling and it is still one of my favorite ways to homeschool. Basically we just assign a subject to each day and focus solely on activities that surround that. For example, Monday = Bible, Tuesday = Science, Wednesday = Literature, Thursday = History, Friday = catch up on all the things that didn’t get completed on previous days. When we were doing this we would do math each day just to try and keep things consistently moving in that subject since it is our least favorite/weakest subject. The beauty of this method is that it is kind of like unit studies in that each subject really covers composition, spelling, reading, critical thinking, handwriting, etc. The kids think they are doing less work (always a win in this house!) but really they are doing the same amount of practice in all of these areas it just feels less noticeable since each day they are working on new subject matter. Ted Ed videos – Do you ever have one of those homeschooling days where everything goes wrong and you need to clean oatmeal out of the carpet and somehow throw food in the slow cooker before you get everyone to ballet/boy scouts/whatever activity you foolishly agreed to participate in and then on top of that you have the pressure of oh, you know, EDUCATING your child? Me either. But if I did have multiple days a month like that then I would surely use Ted Ed to help fill in the gaps when I need to fill those sweet little brains with info and run a household. All kidding aside, Ted Ed is a great way to learn things that don’t fit into traditional homeschool curriculums. They’ve learned about how the band-aid was invented, the paradox of value, and whether spotty fruits and vegetables are safe to eat. I know, I know, not exactly Common Core aligned stuff here but what I love is that it fuels a love of learning. Each lesson includes a video, a quiz, an opportunity to dig deeper into the subject, and a format in which to discuss it. The world is a big place and by learning about some of the more random parts of it my kids have discovered a love of knowledge that I think can sometimes be tricky to impart when you’re hammering them with tests and quizzes. Outsourcing – We utilize a homeschool hybrid once a week as well as a once-a-month co-op class in teaching the kids. Maybe you think it’s a cheater’s way to homeschool. Maybe it is. The thing is I find outsourcing a great way to help the kids learn from others without giving up my ability to help meet their individual educational needs. Once a week the kids spend 3.5 hours at an arts-based hybrid learning things that I would never have thought to incorporate into our schooling. Kai is working with other students on a student film. Ivy is learning Calligraphy. Each of them is working in a group with friends and enjoying being a part of a classroom experience one day a week. Then once a month the homeschool group we are a part of holds an enrichment day that allows the kids to learn about different subjects each month. One month the kids participated in a Shakespearean drama and had a feast to go along with it. They’ve built volcanoes and met geologists and enjoyed learning about cultures from people who are experts in a way I will never be. Each time they come home filled with information and enthusiasm about a subject they hadn’t previously interacted with and it fuels their desire to pursue knowledge about it for the rest of the month. Year-round School – We officially start school every September but the truth is we try our very best to “school” the kids year round. The first year we did school we stopped at the end of summer and when we got back to school-time in the Fall getting the kids motivated to learn again was a nightmare. They enjoyed the summer and didn’t feel like diving back into school. The more I thought about it the more it bugged me that we were basically telling them they got to spend 3 months not learning and that they could stop pursuing the study of the world that we were trying to tell them was so important for the other 9 months of the year. The second year we tried not breaking for summer. We changed the pace of our lessons and did lots of unit studies with the kids. We explored different subjects and cultures and found ways to take unexpected field trips and just kept the learning going. Then by the time Fall rolled around we just jumped right back into “regular” school and no one complained. And we felt like we were reinforcing the idea that learning is a forever thing. Not something to take a break from. It’s been a win-win scenario for us. So, there you have it. 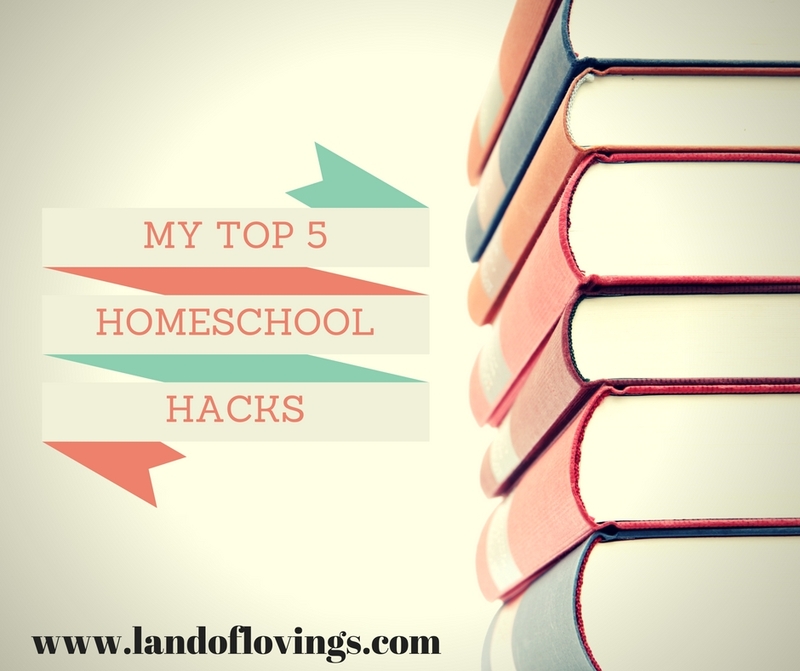 Five homeschooling hacks that are working for us! I would love to hear what works for you and yours when it comes to educating the kids whether it is homeschool, traditional school, unschooling or some combo of different styles. There is so much to be learned and shared with others on this journey and I love storing away great ideas for when we need to change things up!